This item comes in 3 pieces. It comes in colors of Black, Dark Brown, Brown, Coffee, Light Coffee, Light Brown, and Beige. The measurements: 8 1/4 Length x 1 Width inches. Appropriate for all ages to use. Easy to use the bun clips! 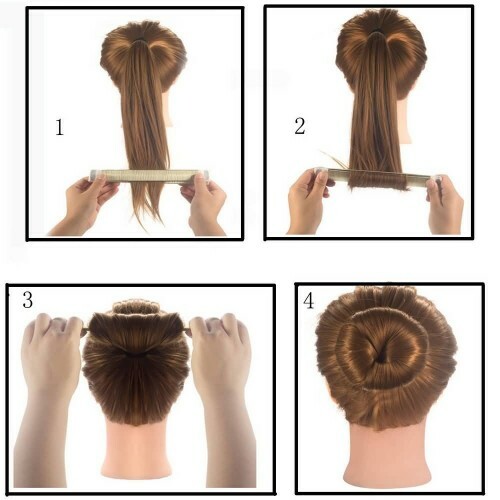 Make a ponytail and then roll up to the clip to base, and bend and snap together the two bands. The result will be simple beautiful bun. Tired of everyday ponytail look? Switch your hair style to beautiful bun. Style it up for day look and night look. Perfect for weddings, party, school, ballet, prom, yoga, and many more!